So we know who won what, we know what they wore, and we saw what they said. Here now is my list of takeaways from the Golden Globe awards, the 10 bits I hail as most memorable. 1. Bill Clinton showed up! That's right, the 42nd President of the United States showed up to introduce Steven Spielberg's Lincoln. Old Bill got himself a standing ovation and looked as classy as we remembered, quite the coup for Spielberg and Dreamworks to pull off. 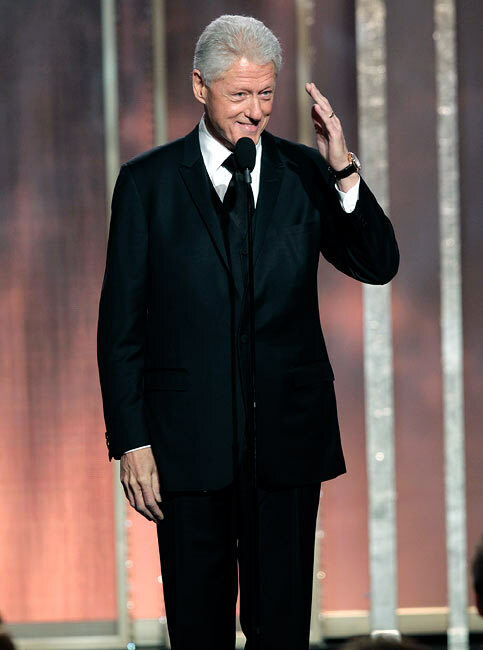 More fun than Bill, however, was the aftermath as hostesses Tina Fey and Amy Poehler proceeded to gush about him as "Hillary Clinton's husband" and "Bill Rodham Clinton." Make no mistake, this was a night of girl power. "I beat Meryl!" trilled Jennifer Lawrence when she won her Best Actress in a Comedy/Musical award, but Hathaway, who won Best Supporting Actress for Les Miserables over Sally Field in Lincoln, showed us how deftly a homage ought be pulled off as she took the stage and went on about her own roots and unexpectedly great career graph and spoke of having Field as an inspiration. If Zero Dark Thirty is hell (as Lincoln may well feel), then it hath found its Miss Phistopheles. Whatever *were* those big flaming horns of hair? 4. 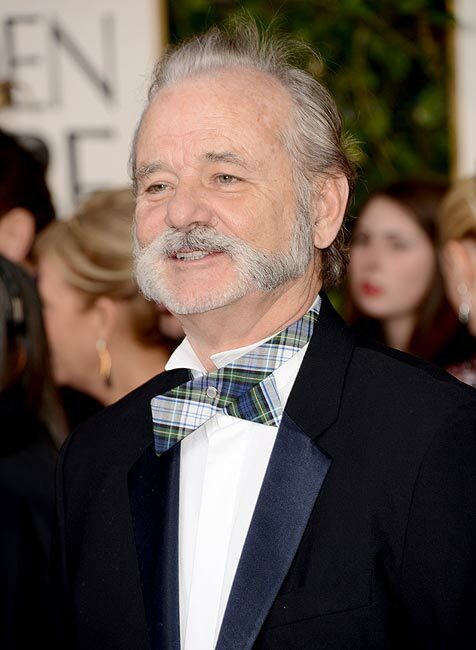 The HFPA gets in on the joke. Long (and rightfully) has the Hollywood Foreign Press Association, the organiser of the Golden Globes, been pilloried by the famous faces it courts, and this year was no exception. But this time they knew the punchline before we did, and current HFPA president Dr Aida Takla O'Reilly was as self-deprecatory as can be, starting her brief speech with "(Former chairman of Walt Disney Studios) Jeffrey Katzenberg will never forget my name -- because he never knew it in the first place" and ending with a randomly flirty plea to Bradley Cooper to call her, maybe. Ha. Many a great line came from the hilarious hostesses, but one of the best came early on in the show. "I haven't really been following the controversy over Zero Dark Thirty," confessed Poehler as she looked right at director Katherine Bigelow, "but when it comes to torture, I trust the lady who spent three years married to James Cameron." 6. Jennifer Garner does Ben Affleck's job. Taking the stage to present an award, Affleck's luminous better-half Jennifer Garner also took the opportunity to correct a massive oversight from her man. When winning Best Director, Ben thanked everyone except his producers, George Clooney and Grant Heslov. Garner called them "the best producers in Hollywood" while Affleck looked sheepishly grateful. Actor Chad Lowe wrote a bitter tweet to Girls-girl Lena Dunham, saying how hurt he was that she thanked everyone but not him -- in reference to the time Hilary Swank once forgot to thank (former husband) Chad at the Oscars. So when Lena went on stage again, she made sure she thanked Lowe. Smiles -- and, yes, more than a few puzzled faces -- all around. Poehler might have had the better lines, but while Fey had the better moustache, her brightest moment came when she, insisting that a young Daniel Day-Lewis played the alien in Steven Spielberg's ET, pleaded with the acclaimed thespian to raise his finger. If ever a man has been more epic, we haven't heard of him. 10. The best line of the night. Award-show staple Meryl Streep was missing from all the amiably drunk Globes sideswipes because she wasn't well. And yet that didn't stop the multiple-winner from starring in the best line of the night. 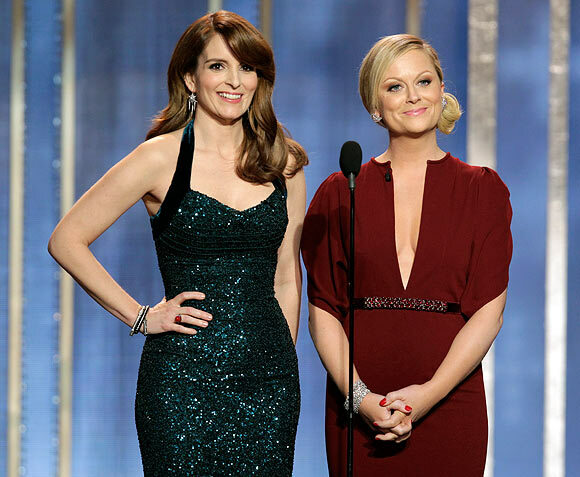 "She has the flu," explained Amy Poehler. "And she's amazing in it." Golden Globes get it mostly right!